The City of Lakewood is a Home Rule Municipality which is the most populous municipality in Jefferson County, Colorado, United States. 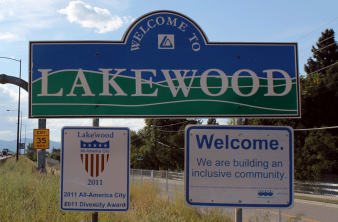 Lakewood is the fifth most populous city in the State of Colorado and the 172nd most populous city in the United States. The city population was 142,980 at the 2010 United States Census. Lakewood is west of Denver and is part of the Denver-Aurora-Lakewood, CO Metropolitan Statistical Area. The urban/suburban development of the community known as Lakewood was begun in 1889 by Charles Welch and W.A.H. Loveland, who platted a 13-block area along Colfax Avenue west of Denver in eastern Jefferson County. Loveland, the former president of the Colorado Central Railroad, retired to the new community of Lakewood after many years of living in Golden.